Luxor Box is definitely an indulgence. It's a beauty, spa and lifestyle box with a selection of 5-9 products and it's delivered bi-monthly. It hasn't been my favorite box mainly because it seems to take ideas from other subscription boxes so often and the brands tend to repeat but that doesn't mean I'm not going to snag a box when I see a spoiler I like. The last box I got was a Holiday Limited Edition and I got it because I knew the spoiler. The Cost: Luxor Box- $139 every-other-month for US deliveries and $160 every-other-month for Canada deliveries. Petite- $50 every-other-month for US deliveries (not available in Canada). What You Get: Luxor Box features 5-9 products ($275+ value). 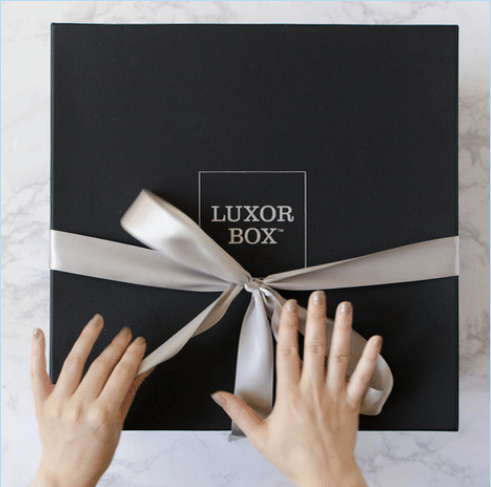 The Luxor Box Petite contains 2-4 ($75+ value) of the 5-9 products being featured from Luxor Box for each shipment. It's an Eddie Borgo Plinth Silver Cuff. Here's the description- "Smooth, polished silver hinge bracelet with geometric details. Perfect on it's own for or layered with multiple bracelets to make a statement." It's also got a length of 2 1/8" which is one of the reasons I want it. First, it's totally my style and second, it's hinged and will actually fit my wrist without falling down to my knuckles. It has been SO difficult (impossible!) to get a bracelet in a subscription box that actually fits so this is pretty nice for me. The retail value on this piece is $225 which is outrageous. I wish it said what it was made out of beyond just "silver." 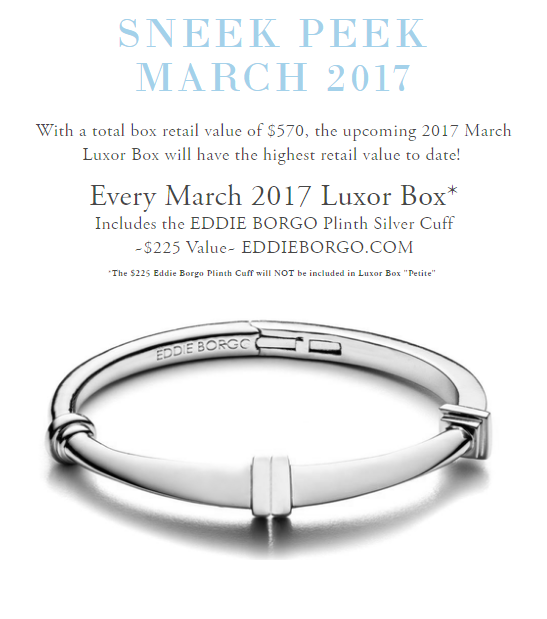 The other reason I signed up for this March box is that it will have a retail value of $570. That means there's $375 left to fill the box with so I'm interested to see what else there will be. If you'd like to sign up for this box, you can do that here. I honestly don't know of any coupon codes (I didn't find one) so if you think this is something you want, don't wait! Are you a regular subscriber? I'd love to know your thoughts on this subscription!! From afar, it seems like there are lots of repeated brands but maybe if I got it I wouldn't care? Tell me what you think!